NextraOne Review 2019: Is NextraOne a Good Hosting? NextraOne is an Indian hosting provider with thousands of customers. They have an uptime guarantee of 99.99% on their selection of Windows and Linux hosting plans. NextraOne is an Indian hosting company with over two hundred employees. They have provided hosting for almost ten thousand customers and have built more than 3000 websites. Their own website is available in English, as is their support. This vendor offers a wide selection of Windows, Linux, and Budget shared hosting plans. The limited Budget plans provide two resource levels: Basic Budget and Standard Budget. These plans allow only one domain, and they come with 500MB or 1GB storage, and 2GB or 4GB bandwidth. The more comprehensive Linux and Windows plans come in four flavors (Basic, Advanced, Business, and Pro) with 10GB, 25GB, 30GB, and unlimited disk space respectively. You get one domain with the Basic and Advanced plans, three domains with the Business plan, and unlimited domains with the Pro plan. All plans include unlimited data transfer. All plans come with the Plesk control panel, a one-click installer for WordPress and other (unspecified) programs, and MySQL databases. At extra cost, they also provide a website building tool which comes with ready-made responsive templates and a drag-and-drop tool. They support PHP versions 5 through 7 but they do not support any advanced coding languages. NextraOne’s infrastructure includes an Indian data center with multiple redundancy layers. They promise high-speed network connectivity from all Tier 1 ISPs, and 99.99% availability backed by a service level agreement. All servers are monitored 24/7. 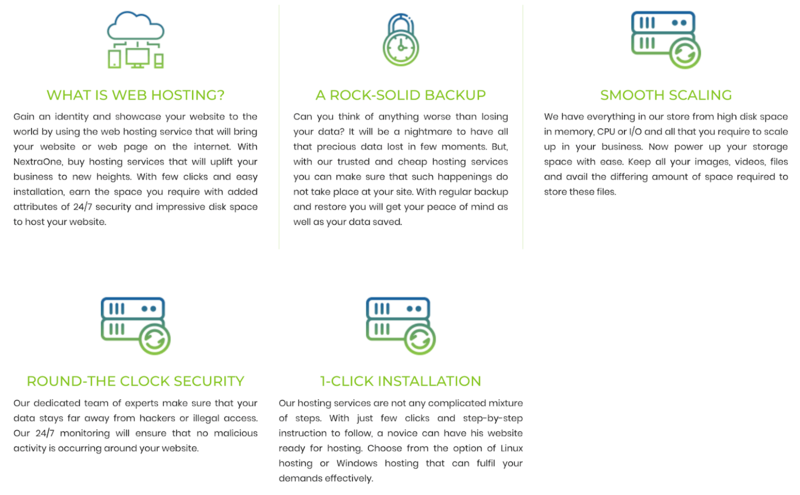 In addition to the good selection of shared hosting plans with on-demand resources, they also offer VPS and dedicated server rental for when your business is really ready to scale up. Their two Budget plans are extremely cheap but are very limited in terms of resources. You’ll get less than 1GB storage, 4GB transfer, and only a “basic control panel.” What’s more, you can only use the Budget plans with one domain and no subdomains. Therefore, most customers will likely need either the Linux or Windows plans, which include identical resource levels on the different operating systems. For these plans, the prices are still very cheap, especially when you consider that the highest plan includes unlimited disk space, domains, subdomains, and data transfer. One of my gripes is that NextraOne does not offer a month-to-month plan, but you can choose one, two or three year terms, and the prices do reduce for longer terms paid up front. They offer a wide range of “combo” deals that include a free .com domain and a free SSL certificate along with hosting an email plans. Again, the prices are very good. Customer support can be accessed by email, telephone, ticket and live chat (although it was offline when I visited). They have a client area behind a login page which I believe also hides a knowledge base, a server status page, and a support ticket system. In an ideal world, they’d advertise their business hours and/or average response times to queries, but overall I’m satisfied with their support. They do, however, have some negative Facebook reviews. NextraOne is a comprehensive website hosting company that uses Indian infrastructure and offers a good uptime service level agreement. They’ve built more than 3000 websites, hosted 10,000 sites, and also hosted almost 2000 email accounts. Wondering how NextraOne stacks up against other Web Hosting companies? Enter any other Web Hosting company and we will give you a side-by-side comparison.